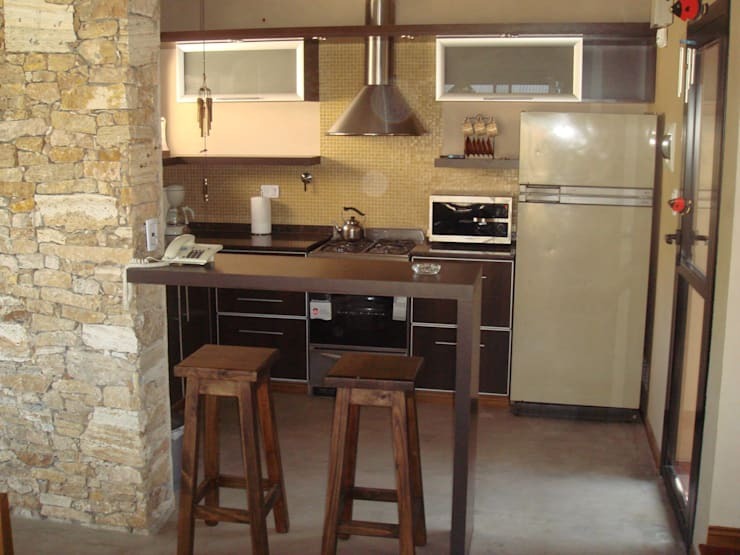 A breakfast bar adds a nice sociable touch to your kitchen, as a place where people can eat while others prepare meals. It makes cooking more enjoyable and less solitary as you talk away with family members or friends and absorb the many aromas and smells. But breakfast bars are not only for big kitchens. Yes, of course, one can build an island table within a huge floor space, but a simple length of counter propped on a stand or legs will often fit quite easily into most kitchens. Try to be creative when deciding where a breakfast bar might be placed. It's easier than you might think! So today, we present 7 inspiring examples of breakfast bars to fit in your small kitchen. In keeping with this kitchen's retro design, the breakfast bar not only serves as a place to eat and drink coffee, but also a partition which closes off the space of the kitchen. The user has decided it is also conveniently placed to plug a house phone into. 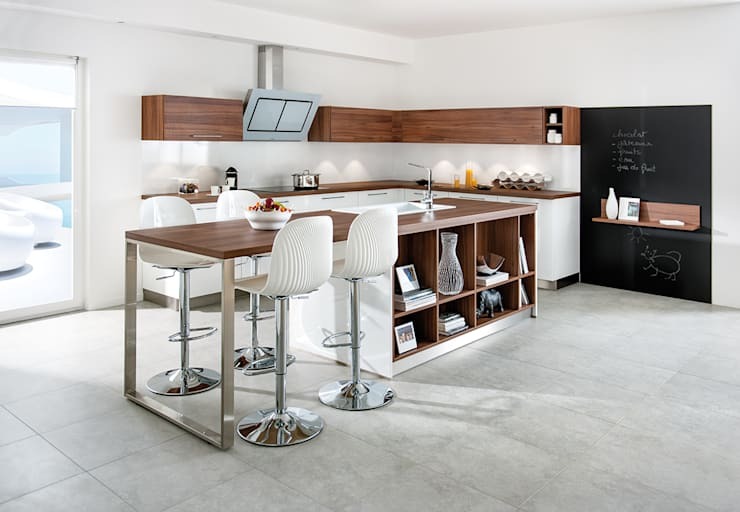 The high stools are matching in designs and the general palette of chocolate brown and cream is inviting. We think you'll agree, this particular breakfast bar design is sleek and elegant. The bar itself appears to be part of the main wall, though closer inspection reveals it to be joined and decorated in the same way so as to give an impression of continuity. The red among the grey, silver and white tones is a striking feature. 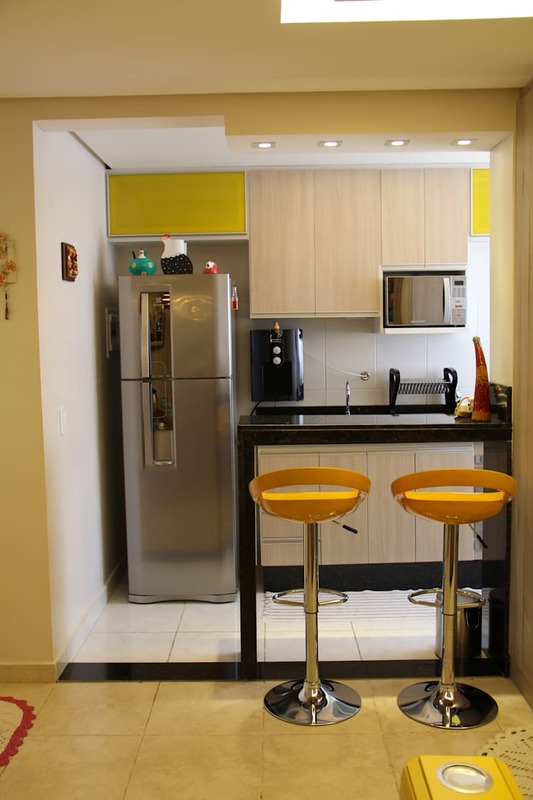 This breakfast bar really makes use of some available space around the corner of the kitchen. Left unused it would be wasted, but the homeowner here has made it a place to eat and relax whilst on the phone. You can see the kettle and coffee maker are in close proximity! 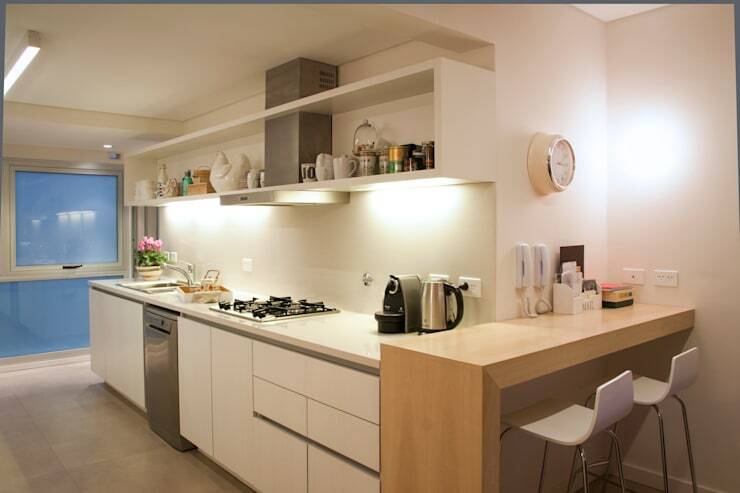 With an open-plan kitchen and dining area, we're usually provided with more space to work with. However, that doesn't mean we should necessarily use every inch and place a huge island table. This neat, thin breakfast bar really does a lot without being too large or imposing. 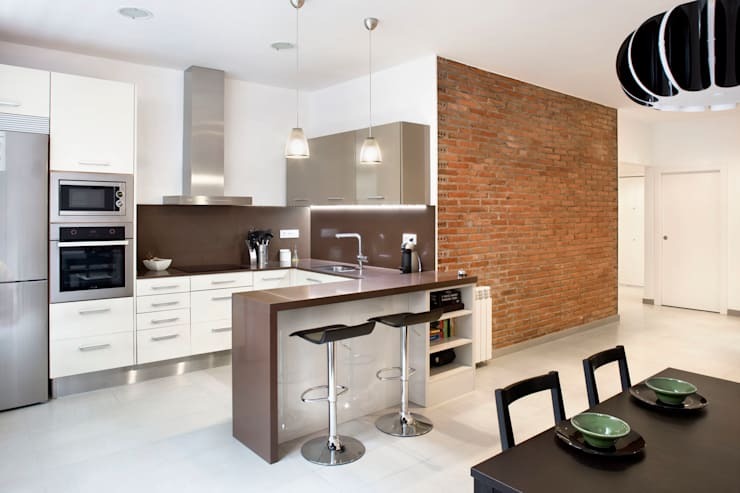 It's chic and refined, with the counter matching the general decor of a stylish kitchen area and exposed brick wall. 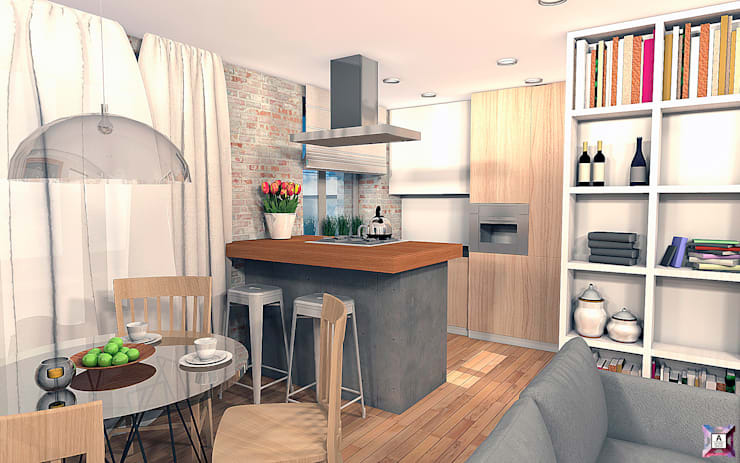 Just when you thought your kitchen was too small for a breakfast bar, here's a design to change your mind! 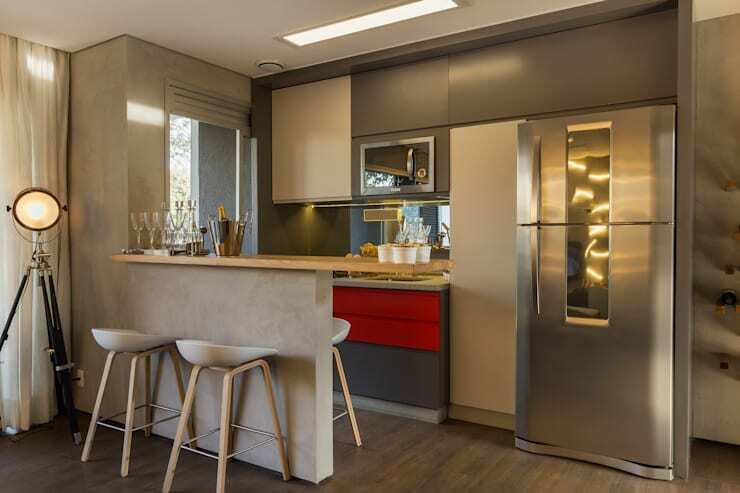 The designer has cleverly made this tiny structure on the border of an open-plan kitchen, placing the high stools along the outside edge to save space. Great thinking! This kitchen island worktop table has been extended to include a breakfast bar with seating on both sides. It's a very sociable design, and you can easily imagine 4 people enjoying toast and tea while someone reads the newspapers. The dark wood panels and white cabinets contrast each other effectively. This is a beautiful kitchen area, bright and welcoming to the eye. This island breakfast bar is planted on a solid base. This type of design can be less comfortable when sitting, as you may bash your knees against the base if the countertop does not protrude far enough over the base. Luckily, in this example, it does! This is something to consider when thinking of your own breakfast bar design. For some more indispensable home tips, check out: 9 ways to get a hotel-style bathroom on a budget. How could you fit a breakfast bar into your kitchen?